Fiona claims she doesn't remember anything about the night her best friend Trixie left a party and walked into the ocean. It's ruled a suicide, but Fiona doesn't believe her Trixie is really dead - and she is determined to find out why Trixie would want everyone to think she is. Fiona enlists the help of Trixie's former best-friend-with-benefits, and their search for the truth leads them toward another suicide case in their small, ocean-side town. But the closer Fiona gets to finding out what happened, the more she realizes that she might not have known her best friend at all. 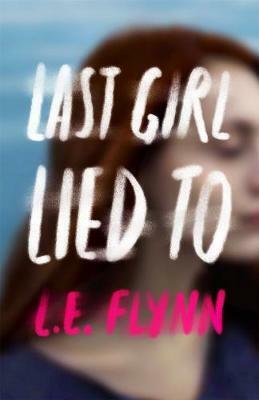 Told in alternating chapters between the past and the present, Last Girl Lied To will appeal to fans of mysteries and thrillers, as well as contemporary readers. L.E. Flynn is the author of Firsts (Thomas Dunne Books/St Martin's Press), a YALSA Best Fiction for Young Adults pick, along with an accompanying series of short stories, The Boys Tell All. Flynn is a former model who worked in Tokyo, Athens, and Paris. Flynn now lives in London, Ontario with her husband, daughter, and the world's most spoiled Chihuahua. When she's not writing, you can likely find her hiking in the woods, perusing thrift stores for vintage dresses, or binging on reality TV.